With 2010 all but upon us, naturally you’ll be thinking how you can fill the year ahead with silents-related activities, and here to assist you is a guide to the festivals and conferences that are coming up over the next twelve months. Information on these is given in greater detail in the Bioscope’s Conferences and Festivals sections, while a summary listing of all events coming up is maintained in the Calendar section. Things kick off in January with Slapstick, the annual festival of slapstick film celebrated in Bristol, UK. This year’s event takes place 21st-24th and features Buster Keaton’s The Navigator, René Clair’s An Italian Straw Hat and Boris Barnet’s The House on Trubnaya Street, plus W.C. Fields, Harold Lloyd and Laurel and Hardy, along with appearances by present-day comic stars Michael Palin, Phill Jupitus and Neil Innes. 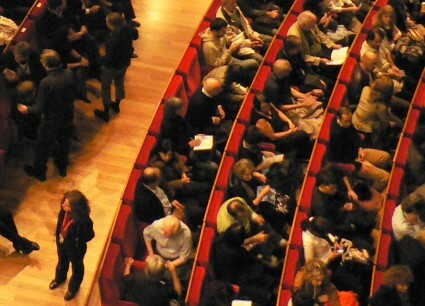 The StummFilmMusikTage Erlangen is a festival of silent film music held in Erlangen, Germany. The 2010 festival has as its motto Tough Guys and Easy Girls and will include Louise Brooks in Diary of a Lost Girl, German gangster film classic Asphalt and Fritz Lang’s masterpieces Dr. Mabuse Part I and II as a double feature. It takes place 28th-31st. February sees the Niles Essanay Film Silent Film Museum’s Midwinter Comedy Festival, running 12th-14th, in Niles, California. Keaton, Griffith, Langdon, Pollard, Chase, Davidson and much more. The Kansas Silent Film Festival is an event held annually in Topeka, Kansas. This year’s festival takes place 26th-27th and has as its special guest Melissa Talmadge Cox, grand-daughter of Buster Keaton and Natalie Talmadge, so Keaton (Our Hospitality) and Talmadge (Norma, in Smilin’ Through) feature, as well as William Boyd and Elinor Fair in The Yankee Clipper and various comedy shorts. With March there is the Karlsruher Stummfilmtage in Karlsruhe, Germany, which takes place 11th-14th and is devoted to René Clair and Jean Renoir; or you may journey to Syracuse, New York for the annual Cinefest, scheduled for 25th-28th, programme to be announced. Meanwhile on the other side of the Atlantic, the Killruddery Silent Film Festival takes place 11th-14th in Bray, Ireland. The programme has yet to be announced, but the theme is ‘Overlooked & Forgotten Cinema’ and Kevin Brownlow is the guest of honour. April 7th-11th features the Filmmuseum Biënnale in Amsterdam, the Netherlands, a festival of music, art and film which has a strong silent film element, including a programme of films from the Museum of Modern Art in New York. April is the new month for the British Silent Film Festival. No longer held in its traditional Nottingham home in June, the peripatetic festival now finds itself taking place at the Phoenix Square Cinema, Leicester, over the 15th-18th. The theme will be the relationship between the natural world and cinema before 1930. In May there’s the festival of silent cinema held annually at Hautes-Pyrénées, France, the Festival d’Anères. Despite rumours that the festival’s future is in some doubt, dates have been announced for the 19th-23rd, though no details of a programme as yet. Or States-side you could head for the classic film convention Cinevent, held as always in Columbus, Ohio. 2010’s convention takes place 28th-31st. June 13th-17th sees Beyond the Screen: Institutions, Networks and Publics of Early Cinema – 11th International DOMITOR conference. The bi-annual conference on the study of early cinema is taking place in Toronto, Canada. Silent film scholars will then have to jet off to Bologna, Italy for the Sixth International Women and Film History Conference, taking place 24th-26th. The theme of the conference is women’s involvement in the silent film industry and culture across the globe. Immediately after, and in the same city, there is Il Cinema Ritrovato, the festival of restored films (always with a strong silent element). The festival takes place 26th June-3rd July, but no details of the programme have been released as yet. The Broncho Billy Silent Film Festival will be held at Fremont, California in June, but exact dates haven’t been given as yet. In July the BFI in London hosts a conference Colonial Film: Moving Images of the British Empire, 1895-1939 over 8th-9th (a second strand takes place in Pittsburgh in September covering 1939-1965). San Francisco hosts the San Francisco Silent Film Festival, this year over 15th-18th. The programme will be announced in late May. At the same time (15th-16th), Slapsticon, the annual festival of silent and early sound film comedy, held as ever in Arlington, Virginia, promises us Ben Turpin, Monty Banks, Mr and Mrs Sidney Drew, Billy Richie, John Bunny, Billy Bevan, Edward Everett Horton and a whole lot more. Or you could look further afield and consider the International Silent Film Festival, a festival of classic silent films held each July in Manila – no exacts dates or programme available as yet. August is clearly the month when the programmers are expecting us to combine holidays with silents. So, you might consider central New York’s Capitolfest, its annual summer classic and silent movie festival, taking place 13th-15th. Or why not sample Aosta in the Italian Alps for Strade del Cinema, a silent film festival with a strong emphasis on musical acompaniment (no exact dates or programme released as yet). Or be bold and head for São Paulo, Brazil to enjoy the highly-impressive (at least to judge by past programmes) Jornada Brasileira de Cinema Silencioso, a silent film festival now in its fourth year (no exact dates or programme details as yet). 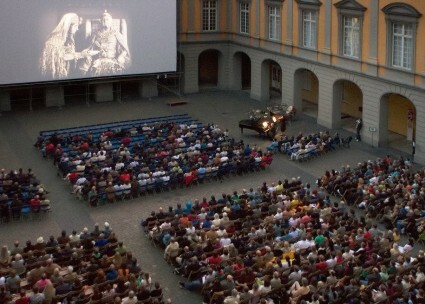 Or maybe Bonn in Germany will tempt you, with its Bonner Sommerkino, a festival of silent film which is yearly growing in importance (no dates or programme as yet). Or you could escape from some of the summer’s heat by sampling Finland’s Forssa Silent Film Festival, also more challengingly known as Mykkäelokuvafestivaalit, which in 2010 takes place 27th-28th. If it’s September then it must be Cinecon, annual classic film festival held in Hollywood, which will run 2nd-6th. 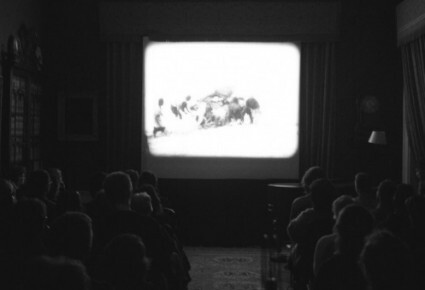 The charming Opitiki Silent Film Festival will be held this month in Opitiki, New Zealand. Over 23rd-26th there’s the silent and early sound film festival Cinesation in Massillon, Ohio, USA, while over the 24th-26th we have the Annual Buster Keaton Celebration, the Buster Keaton-themed festival held in Iola, Kansas. Silents of a different, modern kind feature in the Toronto Urban Film Festival, a public film festival of one-minute silent films held in Toronto, Canada. No dates as yet, but the films are ew productions entered in competition. October is of course Pordenone month. The Giornate del Cinema Muto, or Pordenone Silent Film Festival, is generally considered the world’s leading silent film festival, takes place in Pordenone, northern Italy, and in 2010 runs 2nd-9th. We await the first details of 2010’s programme. October also sees Charlie in the Heartland: An International Charlie Chaplin Conference, which takes place 28th-30th at Ohio University Zanesville, Zanesville, Ohio,and which takes as its theme anything to do with Chaplin and his relationship with, influence on, or evocation of America. Also in October, but no dates or programme announced as yet, will be Australia's Silent Film Festival, held in Sydney. Nothing of any particular relevance seems lined up for November (as yet), but in December there will be the 1910 Centenary Conference, hosted by the University of Glasgow. It’s not about silent cinema itself as its theme is 1910 as an arguably watershed year for the ushering in of modernism, but it includes film amongst its areas of interest, so in it goes (precise dates have yet to be announced). December will also see the San Francisco Silent Film Festival‘s ‘mini’ festival, its Winter Event. If you know of other festivals or conferences I should be including, please us know through the comments. I’ll be adding new events (or updated information) to the Conferences and Festivals sections in any case, and will publicise individual events nearer to their start times in any case. Of course, silents turn up as special screenings in other kinds of festival, such as the London Film Festival and Telluride Film Festival, but I’ve kept this listing to those events largely dedicated to silent films themsleves. Such festivals and conferences are a labour of love and a huge challenge to put on, logistically and financially – do support them if you can. Finally, I recommend the Stummfilm.info site (in English and German) for its handy directory of silent film festivals worldwide. Luke, the info you have included about Cinefest in March is from last year’s programme. The films for the 2010 festival have yet to be announced. The midwinter comedy festival in Niles (Fremont) CA has announced its Feb 12-14 schedule. Thank you both – correction now made and new information added.